Campaigners looking to secure government investment at seven pinch points along the A14 in Suffolk are celebrating today after a highly successful House of Commons event yesterday (23 January) which made a compelling case for the highway to be included in the next strategic roads funding round. The Suffolk Chamber of Commerce-led No More A14 Delays in Suffolk campaign aims to secure £150m of funding under the Roads Investment Strategy (RIS) 2 which covers the period 2020 – 2025. Hosted by South Suffolk MP, James Cartlidge, the gathering of high-profiled political and business leaders from Suffolk and beyond, heard compelling evidence of the A14’s vital importance to both local and national prosperity. 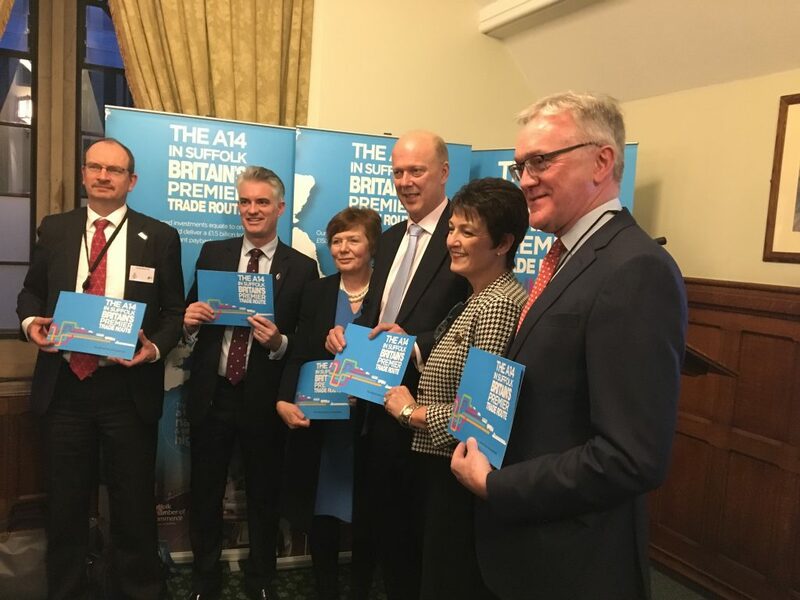 Chair of the A14 Strategy Board, Mark Pendlington emphasised the vital contribution the A14 Suffolk makes to supplying the Northern Powerhouse and Midlands Engine in particular, but also as the country’s premier trade route for exports – an especially important matter post-Brexit. Mark was joined on the speakers’ podium by Cllr. Mary Evans, Suffolk County Council’s cabinet member for highways, transport & rural affairs who detailed the local impact of the A14’s seven pinch points on both businesses and residents. In turn, they were joined by two major employers: John Williams, executive chairman of Maritime Transport, one of the country’s largest hauliers based in Felixstowe and Trevor Tyrrell, chief executive of Claas, a leading agricultural machinery manufacturer located at Saxham, near Bury St. Edmunds. Both John and Trevor detailed the very real costs of A14 delays on the profitability of their company and their ability to deliver goods to their customers across the UK. The A14 campaign will continue to lobby for funding under RIS2 over the following months. A final decision is expected from the Department for Transport in summer 2019.